디브이디로 제작되어 나옵니다. 두달정도 시간이 걸립니다. Prize Winner of the Chain Competition (Poland, 2002) dedicated to contemporary music interpretation. Born in Marseille (France) in 1977, Remi Jousselme won during his studies the French National Competition Rene Bartoli (르네 바르톨리 콩쿠르)for young guitarists, which confirmed his musical vocation! He decided to study with the French guitarist Gerard Abiton in Orleans(오를레앙) then with Pablo Marquez at the Strasbourg Conservatory(스트라스브르 콘써바토리) where he unanimously obtained the diploma of specialization with the congratulations of the jury. 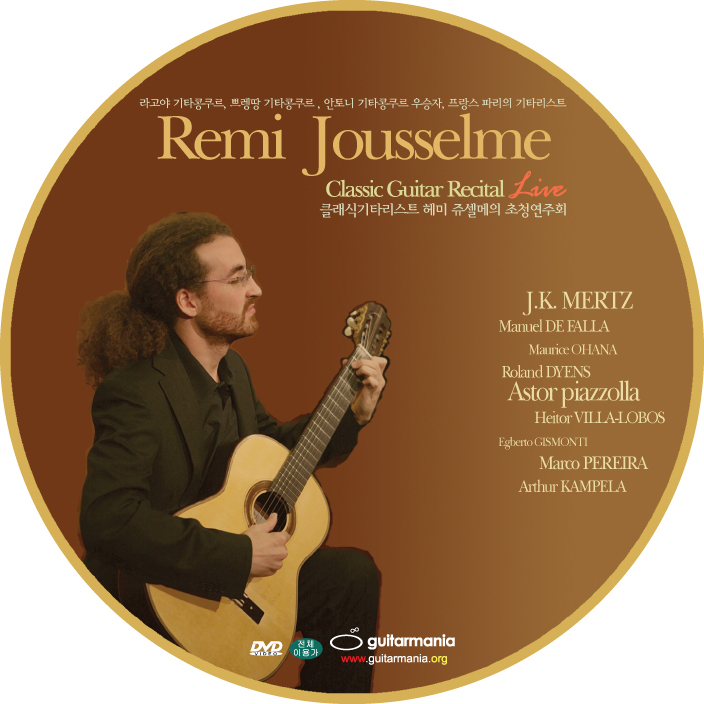 Remi Jousselme also graduated from Aix-en-Provence (액상 프로방스)Music University and attended numerous master classes with guitarists (Eric Franceries, Alberto Ponce, Javier Quevedo, Manuel Barrueco, Marco Socias, John Dearman) as well as with directors (Eric Sobcyk, Pierre-Alain Biget). Remi Jousselme won in few years numerous international competitions, including the Belgium Printemps de la Guitare which for the first time rewarded a French guitarist. He then recorded a CD with pieces from romantic to contemporary repertoire. In 2003, he played with the Ensemble Intercontemporain during the Musica Festival in Strasbourg (France) and the International Festival of Contemporary Music in Alicante (Spain). In 2004, he was invited by the famous Paris International Guitar Festival and earned the highest praise from audiences and critics. He recorded in 2005 his second CD, called Brasiliana and devoted to Brasilian music. Remi Jousselme was then interviewed by Guitare Classique and made the cover of this magazine. Since this time, Mr Jousselme is touring all over Europe, Russia, Asia and South America as a soloist or part of prestigious ensemble (Ensemble Intercontemporain, Compagnie Justiniana, Ensemble Musicatreize...), he's also state professor in the musical academy of Suresnes and Epinay sur Seine, near Paris. 항가리의 Poszoney ( 지금은 체코연방) 에서 태어난 연주, 작곡가로 유년시절 기타와 풀륫을 연주하였고 1840년 비엔나 왕실의 후원으로 데뷰하여 호평을 받았다. 그의 작품은 조국인 항가리의 음율이 내제된 100여곡에 이르고 ( 기타독주, 앙상블, 성악곡) 당시 비엔나의 음악적 취향과 분위기를 잘 전해 주고 있다. Tarentelle ( 타란텔라 ) 이태리 타란토 지방에서 기원한 6/8박자 곡으로 열정적이고 빠른 발동작으로 추는 춤의 일종으로 중세이후 많은 작곡가들의 작곡에 모티브가 되기도 하였고 스페인의 플라멩고중에는 아직도 타란토라는 음악형식이 존재하고 있다. 스페인 국민악파의 대부인 테드렐의 영향으로 안달루시아의 체취가 가득한 스페인의 노래나 민요을 주제로 신인상주의적 경향의 곡을 작곡하였다. 1931년에 일어난 스페인 내란의 휴유증으로 고국을 떠나 아르헨티나로 이주하여 외로운 말년을 지냈다. Homenaje a Debussy ( 드뷔시 찬가 ) 그의 대표적 기타아를 위한 오리지날 작품이고 때론 피아노로 연주 되기도 한다. 스페인 유대계 출신으로 지브랄탈에서 태어난 불란서 소르본 대학에서 건축학을 전공하였고 데니엘 레슬루, 알프레도 카쎄아 로부터 피아노 교습을 받았다. 바르셀로나에서 프랑크 마샬등에게 지도를 받았고 1947년에는 신고전주의를 표방하는 죠디아끄 ( 점성술) 이라는 신진음악그룹의 일원으로 활동하였다. 1950년 기타 콘체르토 ( Trois Graphique ) 를 작곡하였고 오아나는 20세기 몇몇 주목받는 기타 음악 작곡가이기도 하다. Tiento ( 티엔토 ) 는 1955년 작품으로 그의 음악적 특징인 16세기 스페인궁정 음악인 소위 비우엘라 악파 ( 루이스 밀란, 무다라 ) 와 북아프리카의 음악 ( 아랍풍의 음악) 의 영향을 받아 작곡된 작품이다. 아직도 이런 이름의 곡이 플라멩고나 16세기 작곡가인 푸엔야나의 곡으로 남아있기도 하다. 불란서 유행가 편곡으로 샹숑의 역사는 중세시대인 14세기 까지 거슬러 올라가기도 한다. 소위 샹쇼니에에게 불리워져 대중에게 친근한 유행가 이다. 샹숑은 미국의 팝음악이나 째즈의 영향을 받기도 하였으나 불란서 특유의 언어적, 시적,문학적,미학적인 특징을 가지고 있고 서정적 멜로디는 이들의 감성을 대변해 주고 있다. 빌라로보스는 브라질의 위대한 애국적 작곡가로 어떠한 작곡가들도 관심을 가지지 않았던 브라질 음악의 발굴과 연구를 위하여 아마존 밀림에서 길거리 악사에 이르는 정리되지 않은 브라질 음악을 체계화하고 정리하여 후세 브라질 작곡가들에게 이정표를 세워놓는 역할을 하였다. Valsa-Choro ( 발사 쇼루 ) , Chorinho ( 쇼리누 - 작은 쇼루) 빌라로보스의 초기 작품으로 브라질 대중음악 조곡 ( Suite Popula Brasileira ) 에 속해 있는 곡으로 1908 - 1912년 사이에 쓰여졌다. 쇼루는 일반 대중사이에서 전래하던 복합적, 문화적 배경을 가진 곡이며 유럽과 아프리카의 혼합적 색채를 띠고 있다. 브라질의 피아노, 기타아 연주 작곡가인 지스몬티는 성서의 상징적 단어 Agua & Vinho ( 물과 포도주 ) 로 쓰여졌으며 우리에게 잘 알려진 곡이다. 클래식, 재즈, 현대음악을 넘나드는 크로스 오우버적인 작곡가의 자유스러운 기량과 아방가르드적 재능을 가진 작곡가이다. 상파울로 태생으로 이사아이스 사비우에게 기타를 배웠고 파리의 소르본 대학에서 수학하였다. 타레가 국제 콩쿨, 세고비아 콩쿨등에서 우승하였으며 많은 브라질의 대중음악가인 갈코스타, 길베르토 질, 톰죠빔 ( 보사노바음악가) 들과 음반작업을 하였다. 현재 국립 리오데자네이로 대학에서 화성학, 편곡, 재즈등을 가르치고 있다. Num Pagode Em Planaltina 이곡은 브라질 플라날찌나 지방의 파고데 라는 브라질 특유의 음악형식이며 삼바리듬을 주축으로 한 브라질풍의 재즈음악이다. 쟈웅 보스꾸라는 음악가를 기리기 위한 작품이다. 그리고 일렉트릭 베이스 기타아에서 쓰이는 스랩 ( Slap ) 주법을 사용하였다. 1995년 카라카스 국제 기타 콩쿨에서 우승하였고 작곡, 연주, 가수이기도 하다. 그의 음악은 브라질 민속음악과 현대음악의 접목을 추구하는 특성을 가지고 있으며 일련의 시리즈인 Percussion Study 는 새로운 기법인 Tapping 주법으로 기타를 두드리거나 때로는 잡음을 동반한 기타의 타악기적 접근과 해석이기도 하다. 빠리에서 만났던 헤미 쥬셀메이 한국에서 연주회를 했군요. 실력이 뛰어난 기타리스트인 만큼 양질의 공연을 했으리라 생각합니다. 가서 봤으면 좋아겠지만 나중에 빠리에서 다시 볼 수 있길 기대해야죠.